S.C. Pannell Wines (http://www.pannell.com.au/) – Stephen Pannell and co. came into the office last week with plenty of wine, in a silver tech suitcase sized thing which opened up at the top revealing a wine opener holder, cork holders, wine glasses, the lot – ready for action! This meant serious wine business. Indeed interest was never to drift off with these quirky winemaker. S.C. Pannell wines are dynamic and different – bending Australia’s style and beliefs in wine (outside of the typical Big Bold Blousy Reds of Aus), and showing what we can grow in other styles of wine , yet somehow still retaining its authenticity and making it seem like it was meant to be a part of Australian wine a long time ago… Stephen also grew up in the family that founded Moss Wood wines, and has many many years of experience in Wirra Wirra, Hardy’s, Tintara, Domaine des Comtes Lafon (Burgundy), Chateau Mouton Rothschild (Bordeaux), G.D. Vajra (Barolo) and more… As well as winning the International red winemaker of the year (London), winning the Max Schubert Trophy Twice over (winemaker at Penfolds), the Jimmy Watson Memorial Trophy just to name a few. Oh! And listed as one of the 50 Most Influential Contributors to the World of Wine by Decanter magazine. 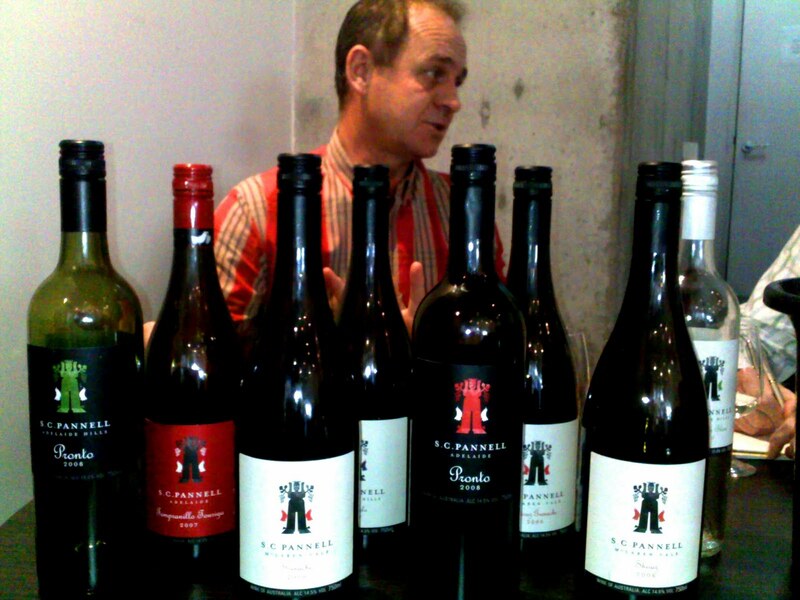 So… S.C. Pannell Wines is the perfect example of his knowledge in the art of winemaking. Also – we need more winemakers like Stephen that’s trying new things and prove the rigid winemakers, with strict ideas in how wine should be made, wrong (not wrong but that their way is not the only way). Australia has much more to offer in our wine styles than most people realise. As James Halliday has recently foretold, “This is a label which is well on the way to Icon-status”, and giving it 5 stars in his recent release of Australian Wine Companion 2010. Pronto Bianco, 2008 – A blend of Sauvignon Blanc, Riesling and Pinot Gris! Fruity but got good texture to it as well unlike a straight usual Sauvignon Blanc, well lined with a crisp acidity. Sells for about $21 – and worth it! Especially compared to the plenty of $20 Sauvignon Blanc wines around that aren’t actually that great. Grenache Rose, 2009 – Old, Dry-grown bush vines, from McLaren Vale, which is impressive in the way it can grow Grenache (Garnacha). Sells for about $21. Lovely with a picnic or summer day drinks. Pronto Tinto Red, 2008 – Aroma of fresh crisp strawberries, floral notes, and a hint of rosewater, leading to a dry finish. Predominatly Grenache, with some Touriga and Shiraz. Influence of Spain and Portugal through grape varieties. Eclectic taste of rose, musk, spices, and a little fruit but not much. From McLaren Vale, a 65 year old vineyard. No oak influence, therefore plenty of fruit on the palate. Sells for about $21 – great value! Shiraz Grenache, 2006 – Concentrated flavour and colour a dark crimson red. Grenache lifts the nose giving perfume to the wine, with touched of musk and red berries, along with some more bold Shiraz aromas of cocoa, black cherry and small berries. Plenty of fruit freshness but with elegance. Earthy notes of oak and spice come in. Made from Old, Dry-grown bush vines, McLaren Vale. A little more Shiraz than Grenache. Both grape varieties were co-fermented in small open top fermenters, to help them both integrate well into each other. French oak influence. Will age for another 8+ years. Fantastic wine! Sells for about $38. Enjoy it with a nice dinner, such as tapas etc. Grenache, 2006 – Deep colour, dense with crimson notes. Aroma is complex with many notes from forest fruits, earthy and leafy characters, and even a hint of rose… High amounts of juicy fruit (makes your mouth water), and a high amount of grippy tannins which adds appreciative texture to it’s rich palate, laced with herbs and spices. Tasty! And Great finish that lasts… Aged in French oak. Made from 67 year old bush-grown vines in the Vale. Can age for another 8+ years. Sells for about $56. Great wine to cellar. Nebbiolo, 2007 – A blend of 5 different clones of the grape. Quite an elegant nebbiolo – highly perfumed with roses, cherries and hints of wet earth and leather. Powerful tannins along underlying cocoa and plush black fruits. From Adelaide Hills. Age for at least another 7 years. Sells for about $46. Great wine to cellar, and a great example of Australian Nebbiolo in its early history. Shiraz, 2006 – Deep ruby red colour, and a finer, more elegant style Shiraz which is not really big on fruit flavour but more on the beetroot, pomegranite, leather and anise as well as other earthy notes… From old vineyards (one of them well over 100 years old), McLaren Vale. Will age for 8+ more years. Sells for about $56. Cellar it. Nice post Sarah :)I can't believe I still haven't tasted any Pannell. Must fix that. wine that tastes like leather…? Is that a good thing? I like this cocoa business, wine should taste like chocolate. Where can you buy the wines? Any bottle shop?